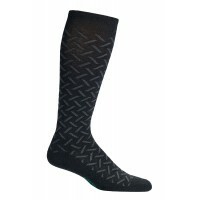 Moisture wicking fibers transport sweat away, maintaining a comfortable foot temperature. Moderate graduated compression (15-20 mmHg) pushes blood upward to promote blood circulation and minimize swelling while reducing fatigue. The deeper heel pocket is anatomically designed to hug the shape of your foot. Extra plush cushioning is designed for impact resistance and protection from blister-causing friction. The seamless toe box prevents blisters and irritation of the toes for ultimate comfort. 24% wool, 56% acrylic, 20% nylon. Suggested sizing: Small/Medium (Women's shoe size 5-8), Medium/Large (Women's shoe size 9-12 or Men's shoe size 7-10), Large/Extra Large (Men's shoe size 11-14). 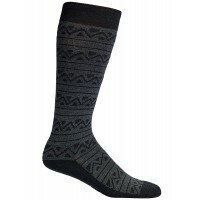 Moisture wicking fibers transport sweat away, maintaining a comfortable foot temperature. Moderate ..